Surface Touch Cover 2: What's next for Microsoft's refreshed tablet accessory? It's a new day and Microsoft has launched a new salvo of products into the tablet market with Surface Pro 2 and its RT little brother, the Surface 2. While the two upgraded units headlined Microsoft's Sept. 23 event in New York City, arguably one of the more interesting bits of tech to come out of the Surface shindig was the Touch Cover 2. The new Touch Cover is basically one giant, felt covered touchpad that can track your finger movements with no less than 1,092 touch sensors. It's a remarkable upgrade compared to the 80 sensors found in the original version's low-power, super-fast film multi-touch digitizer. To get a peek at the technology behind the Touch Cover 2 we got a chance to speak with its head creator, Stevie Bathiche, director of research at the Microsoft Applied Sciences Group. Bathiche said he and his team have been working on the tech inside the Touch Cover 2 as soon as the first Cover made it out the door. The end result is a new touch sensor array that blankets a much larger map, ensuring users won't miss any keys. On top of preventing typos, the new Cover can also detect how hard you're pressing by sensing pressure as velocity. "Capacitive touchscreens have tried to do the same thing by looking at the pad of your finger," Bathiche explained. "But it can only go so far because there's glass." 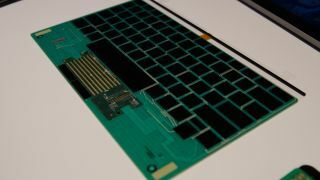 Other than typing, the new touch sensor matrix is a reconfigurable "platform-level technology." Bathiche said they could literally throw on a new piece of fabric, tweak the SDK, and they would have a new type of Cover beyond the touch keyboard and Music Cover. There could be a Wacom-like art pad, something designed for commerce with a calculator, or even game controllers. The potential applications are nearly limitless. What will Microsoft cook up for Covers next? We also managed to snag some time with Bryson Gordon, a marketing director on the Surface team spearheading the Remix Project, which has already created a modified Touch Cover for Garage Band-style DJ apps. "What we are trying to show with the Surface Remix Project is that you can go think about being productive with a tablet in a entirely new way," Gordon said. "Productivity does not just need to be about Microsoft Office. Clicking in does not just need to be about a keyboard. You can actually be productive, which in this case means being creative." After the Music Cover was developed by Microsoft, the team ushered it to students at the Art Center College in Pasadena and presented them with the challenge of developing their own usage ideas. Over the course of three days, Microsoft all but locked the students into a room as they came up with applications for new Surface Covers. Gordon said the students' ideas led to questions such as, "Why can't this be a piano keyboard? Why couldn't this be a drum pad? Or why couldn't this be a game controller, where the harder I push down something else happens? There are a lot of things you could do with it." The Music Cover is just the start. Microsoft wants to hear more ideas from customers and application partners about what they want to "click in," the company's catch phrase for connecting to peripherals. Gordon explained that the bottom of the Surface was really designed to be an open edge for users to add functionality. "It's a starting point for a new interactive platform on the Surface," he said. "What's next is figuring out the next set of Covers that can take advantage of the technology. You'll probably see it before you know it." We've got our hands on reviews of the Surface Pro 2 and Surface 2 for you. Come on, what are you waiting for?